Loewe Bild 7 is the company’s first OLED TV | What Hi-Fi? Loewe’s first OLED screen sports a typically luxury design and a long features list. The Bild 7 will take its place as Loewe’s new flagship TV when it launches in September. The OLED panel itself is made by LG, which given its track record for OLED screens, is a sensible choice. Loewe says it has then added its own picture processing technology along with a smart, minimal design. Loewe has called the combination of the OLED panel and its own picture processing technology, ‘VantaVision’, taking inspiration from VantaBlack, the darkest man-made substance ever created. The Bild 7 ('bild' is 'picture' in German) is available in 55in and 65in screen variants, with both supporting 4K Ultra HD and High Dynamic Range (HDR) video. 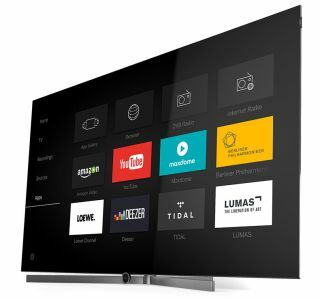 Loewe says the Bild 7 also ticks all the necessary boxes to be Ultra HD Premium compliant, while Dolby Vision support is promised for shortly after launch. The Bild 7 also comes with a bit of a party trick in the form of an incorporated soundbar that extends out of the bottom of the screen when it’s turned on. Turn the TV off and the soundbar disappears out of sight. The soundbar features six active drive units with 120 watts of amplification. Loewe bullishly claims it delivers twice the power of the incorporated soundbar in the LG G6 OLED TV. The bass reflex design found on previous Loewe TV speakers has been ditched in favour of four ‘racetrack’-style auxiliary bass radiators. These claim to “dramatically enhance” low-frequency performance, resulting in a sound that’s “rich, detailed and capable of room-filling volume”. Loewe has also installed a 1TB hard drive (expandable to 2TB) within the sub-7mm chassis, allowing users to record content from the built-in Freeview HD tuner. Loewe’s DR+ hard drive can also be accessed by other Loewe TVs, allowing you to stream recorded content from one TV to another. The triple tuner on the Bild 7 allows users to watch one programme, while following a second in picture-in-picture mode and recording a third. Also on board is wireless Bluetooth and DLNA streaming, plus support for Dolby and DTS decoding. The Loewe Smart Assist app, which is available for iOS and Android, allows you to set and schedule recordings on your smartphone. The Loewe Bild 7 OLED TV will be available from September priced at £4490 for the 55in model and £6490 for the 65in. Both TVs come complete with a wall-mount, with motorised floor and table stands available as optional extras.